Oh really? Then I don't want to link to your video. 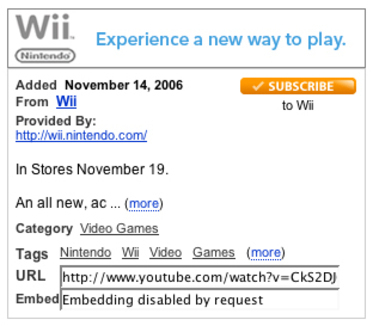 Nintendo has uploaded a video Ad on You Tube and disabled the embed feature. So you have to go to You Tube to view it there. Don't spend too much time digging around for it. It's a typical 30 second spot, manufactured hipness and all—you're not missing out on much.